The choice of the Netherlands for Panasonic’s new financial and tax base for its pan European business, to be shifted out of the UK in October of this year to prepare for Brexit comes as no surprise – even though most of Panasonic’s regional business coordination is in Germany. In fact I even predicted Amsterdam would be a top choice for Japanese companies in 2013 when Brexit proofing strategies were first being discussed. 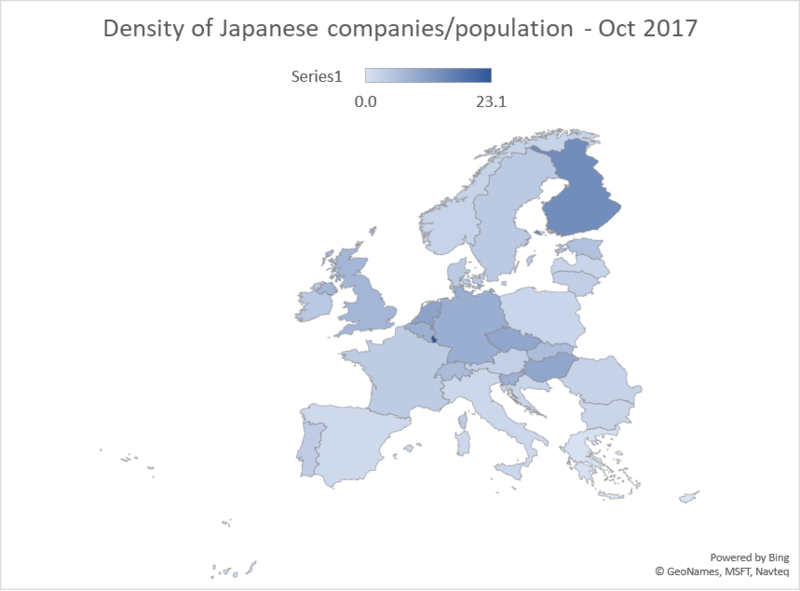 As pointed out in a previous post, the Netherlands has a relatively high density of Japanese company transferees, 4th in Europe after Luxembourg, UK and Belgium. This population has been expanding rapidly since 2015 too – 23% more Japanese people on company transfers in 2017 compared to 2015. The number of Japanese companies in the Netherlands has not risen much over the three years, however. So most of these transfers will have been in order to strengthen presence there, rather than start up a new operation. The attractions of the Netherlands as an alternative to the UK over Germany are not only that is easy to function in English, but also that Amsterdam/Amstelveen area has long had a good infrastructure of networking opportunities with an active Japanese Chamber of Commerce and the Dutch & Japanese Trade Federation, and plenty of lawyers and financial services companies with experience of supporting Japanese companies (who have been busy recently offering Brexit seminars and advice). The Amsterdam lifestyle is congenial, and there is a long history of mostly good relations between the Netherlands and Japan. 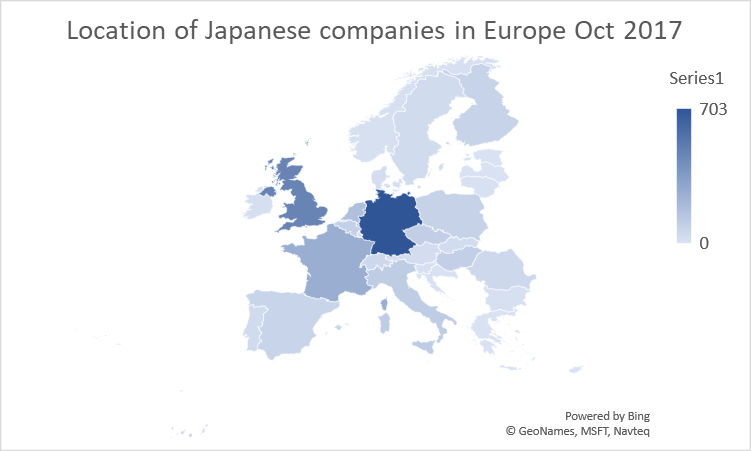 Which is not to say that Germany has been left out either – according to Japanese Ministry of Foreign Affairs figures, Germany still has the most number of Japanese companies in Europe – 703, if only incorporated subsidiaries are counted, rather than branches. This represents a net increase of 20 companies over the past three years,with 8% more Japanese company expats in Japan in 2017 compared to 2015. Crunching the numbers against population size reveals some interesting results – Netherlands has a high density, as you might expect, but Finland turns out to have a higher density – with a larger number of Japanese companies than you would expect, given the size of its market. Most of the 46 Japanese companies in Finland in our database are technology or machinery sector, often with production in Finland. The highest density country, just as it was with numbers of Japanese expats, is Luxembourg – but of course it only has a half million population. The Czech Republic and Hungary also have a high density of Japanese companies – again a large proportion being manufacturing. Of the big Western European economies, Spain and Italy have relatively fewer Japanese companies than you might expect. The really interesting story is where the shifts have been over the past three years – there is one clear winner – Czech Republic – it is home to 82% more Japanese companies than three years’ ago. Other growth spots are Sweden, Norway, Poland, Slovakia, Hungary, Lithuania and Switzerland. Big losers have been Italy, Austria, Bulgaria, Denmark, Greece and Latvia (although admittedly, some of these did not have many Japanese companies to start with). Newcomers to the Czech Republic that we are aware of have mostly been in the automotive industry: Central Glass, Linical (clinical research organisation), Nippon Paint Automotive Coatings, Hakuto (trading company), Obara (automotive welding products) and Tsubaki Automotive. So the growth in company numbers is to the east and Nordics, mainly in manufacturing. The consolidation and integration of services sector business and functions across Europe is benefitting the Netherlands most of all. *The commonly used figures for Japanese companies in the UK are 800 or 1000. There at least that many Japanese entities in the UK but some of them are multiple branches, or joint ventures or brass plate only. I have used the narrow definition of what is called “honten” in Japanese – the main organisation/parent company, to aid accuracy and comparisons. Last updated by Pernille Rudlin at August 31, 2018 .